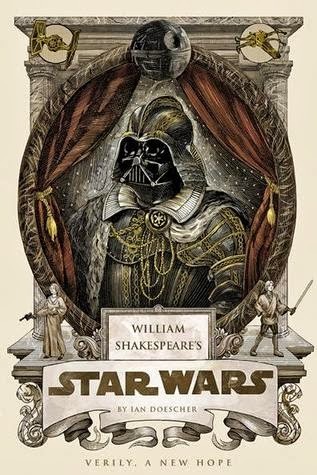 This is absolutely a book only for people who love Star Wars. But why would you read it if you didn't? You'd also need to have a certain love, or at least appreciation, for Shakespeare. Sure, it's a niche audience, but I'd bet it's a pretty sizable niche. And, astonishingly, Doescher does an admirable job serving that niche. What I expected going in was that this would essentially be the script of Star Wars, with a lot of "anon"s and "prithee"s thrown in. I wasn't expecting that Doescher would actually rewrite the entire thing in iambic pentameter, creating new lines, new speaking parts, and new monologues where none existed before. Some of these work amazingly well. Like Leia's aside as she grieves for Alderaan. Or, far more fun, the glimpses he gives into the convoluted thought processes of stormtroopers. And of course, the most quoted lines from Star Wars are represented, in altered form. But Doescher really should have restrained his impulse to write in pastiches of well-known lines and monologues from Shakespeare. I could have lived a long time without reading, "What light through yonder flashing sensor breaks?" I also felt like there were a few too many "anon"s and "aye"s in places where they seemed like they were being included just for color and to keep the iambic pentameter going. And I bet somebody who has studied more Shakespeare than me could find a lot more fault than that. But is it enjoyable? Of course. I'd pay cash money to see this performed live. There probably isn't a single good reason for this to exist, but does there really have to be?